[Limpkin] picked up a beautiful painting of Budda while in Bali because he thought it would react well with different colors of lighting. His overall goal was to create a picture frame with built-in LEDs. The major design specification for the project was to provide an indirect light source that would not shine in the viewers eyes. He got down to business designing a frame using SolidWorks for his modelling. The final design has a separate track from the paining with small dividers for each diode. After about four hours on the CNC machine it was time to get down to soldering. [Limpkin] had 576 RGB LEDs on hand. He’s not looking to drive them individually, just to have independent control of each color. This makes the soldering a bit easier as there will be just three MOSFETs to drive each color. The final product looks great and can display any mix of colored light. Not bad for 50 hours of soldering. Take a PIC 24HJ256GP206 processor and add a dash of knock-off touchscreen and a pinch of SD card compatibility for a DIY digital picture frame. [Daniel] wrote his own driver for the HX8347 controlled LCD that can achieve 15 FPS at 320×240 resolution with 16-bit color. As this was a gift for his wife, [Daniel] included a heart-shaped ring of LEDs that fade in and out like an electronic pulse. He notes that the JPEG decoder runs rather slow but that’s mostly because of the bottleneck caused when accessing data from the SD card. We’ve got more pictures and a link to the source code after the break. 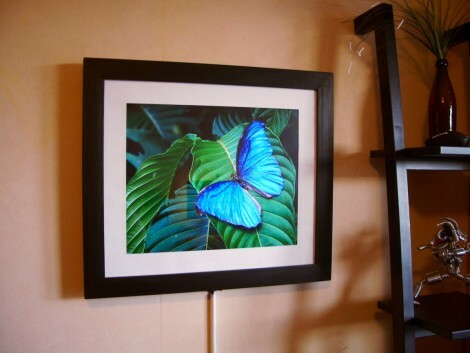 We’ve all seen a million digital picture frames. Usually, people use an old outdated laptop or something. [Quinten] just sent in this one he made using an Eeepc 701. Being the first one available, the smallest both in terms of screen size and storage, they are available pretty cheap. There’s nothing amazingly groundbreaking here, just yanking all the parts out of the Eeepc and mounting them, nicely, in a wooden frame. [Quinten] did a great job getting everything in, with the least amount of space wasted. It strikes us that He has made a super cheap tablet conversion, he’s only missing the touch screen. We’ve seen Eeepc tablet conversions, but they seemed to have much more difficult to construct cases. [Tobe] shares living accomodations with a few other people, so he built this tool to help them all communicate. using a Samsung SPF-83v wifi enabled picture frame, he’s made a central location for things like shopping lists and messages. He uses PHP for the database accessing and writes it all to an image using gd. Every 15 minutes a cron job runs that pushes the updated image to the picture frame. 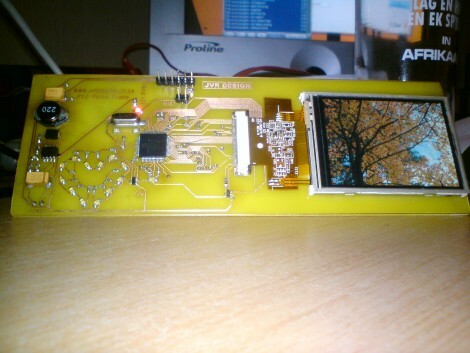 The Coby DP-151sx Digital picture frame keychain seems to be ripe for hacking. At roughly $9, you get a screen, and Li-Ion battery. That’s not bad considering a similar screen alone would cost $20 elsewhere even though it runs on a slower serial connection. While they’ve only put a 3 color pattern on it so far, more can’t be far behind. If you don’t feel like actually tearing it apart, there are some projects that have managed to customize what it displays via the USB connection.